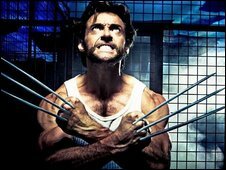 A US columnist is out of a job after posting an online review of an illegally downloaded copy of X-Men Origins: Wolverine. Roger Friedman, who wrote the piece on his regular column, had worked at the Fox news website for 10 years. Fox News said that the company's representatives and Friedman "mutually agreed to part ways immediately". It said that Friedman's behaviour was "reprehensible" and that it "condemned this act categorically". The journalist wrote in his column on Thursday that downloading the 20th Century Fox film was "so much easier than going out in the rain". He added: "I doubt anyone else has seen this film. But everyone can relax. I am, in fact, amazed about how great Wolverine turned out. It exceeds expectations at every turn." He also joked he might decide to catch up on some other recent films via illegal downloads. The review of the film, which 20th Century Fox described as a "stolen, incomplete and early version," was later removed from the site on Friday. The leaked copy of the film was downloaded an estimated 100,000 times in the 24 hours since it was first posted on file sharing websites, a month before its cinema release. Fox promised that the source of the film would be prosecuted and said the FBI and Motion Picture Association of America were investigating the leak. The film is due to be released in UK cinemas on 29 April.